View of the Rwenzoris from the road to Saaka Originally uploaded by acavender. This photo comes from the west of Uganda, on the road between Fort Portal and Saaka. 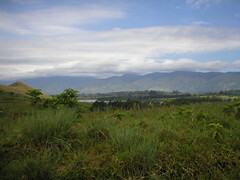 The mountains in the distance are the lower reaches of the Rwenzoris. The pictures look great. But I can’t help but wonder whether looking at them will make it a bit more difficult to get through the South Bend winter!